Bearables is a range of woodland-themed wearable LED badges and sensors. Wear the badges on their own, or connect them to one of the sensors with conductive thread to bring them to life. Designed for kids* (suggested age 8+) and grown-up kids alike! 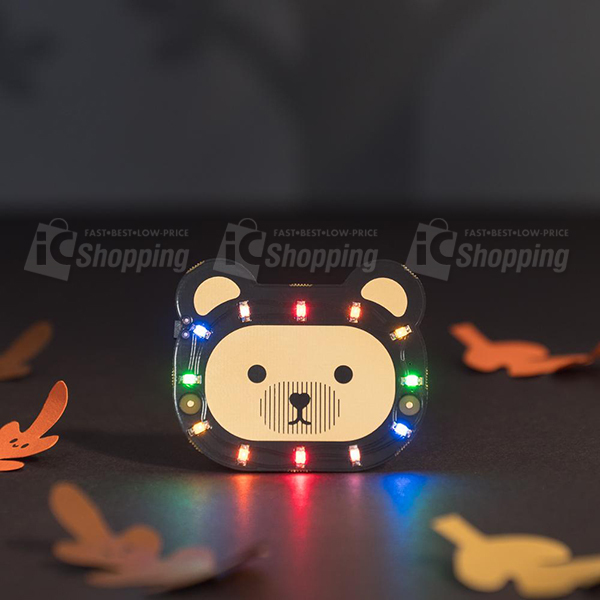 Attach the acorn motion sensor to the Bear badge and when you move the sensor your badge's LEDs will light up. 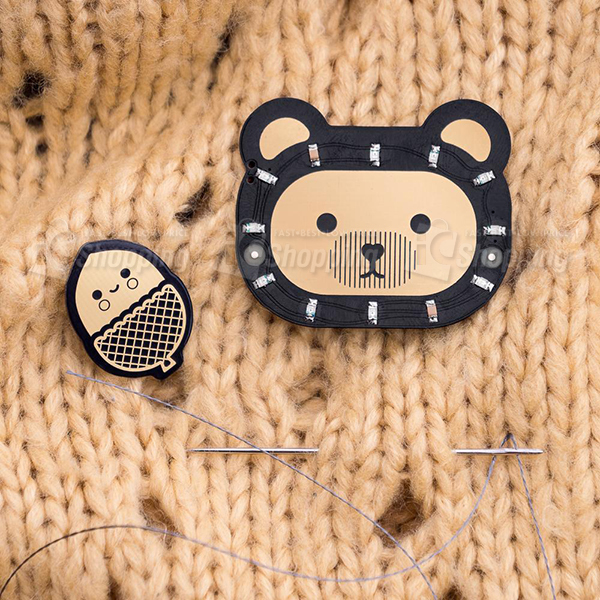 In their five star review, The MagPi said that Bearables were "excellent value for money" and that "the badge kit has everything you need to sew your interactive badge and sensor to clothes". ※Contains small parts. Not suitable for children 3 years or younger. This is not a toy. Keep battery out of reach of children. If ingested, seek medical help immediately. Press the multi-functional button on your badge briefly to cycle through the light patterns. Each of the LEDs will light to indicate which of the 12 patterns is currently selected. Press and hold the button to put your badge into sleep mode. The nifty design of the badges and sensors means that it's super-simple to connect them. It doesn't matter which way round they're connected. Just connect one hook on the badge to one hook on the sensor with conductive thread, then do the same with the other two hooks. Once a sensor is connected, press and hold the multi-functional button to put your badge into trigger mode. Now when you trigger the sensor, the LED lights on your badge will light up. Be aware that conductive thread is sharp! 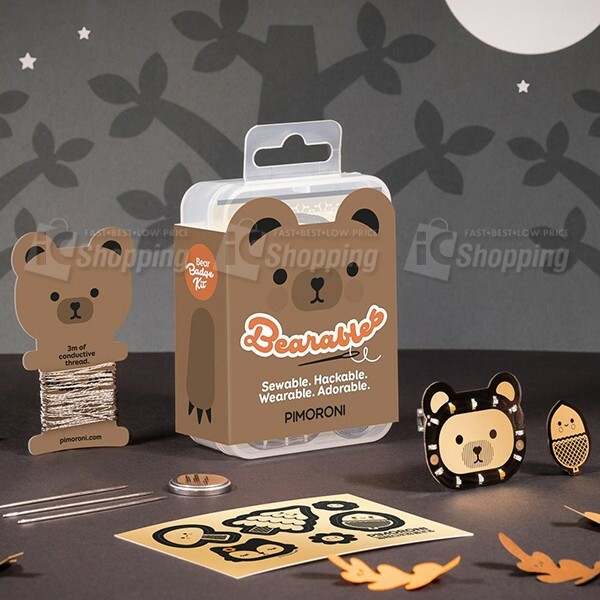 Ensure that the two pieces of conductive thread connecting your Bearables badge and sensor do not touch, bearing (pun intended) in mind that they may touch when the fabric is creased or folded. Nothing bad will happen, the sensor just won't work as it should. The hooks on the back can be shorted without any damage to the badge, although it may trigger the LEDs similar to triggering them with a sensor. A painted or coated safety pin will work better than a bare metal one.